Home » Favorites » Sponsors » Video » Create a beautiful portfolio for your artwork today for FREE at Silk.co/artists! 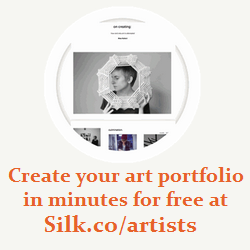 Create a beautiful portfolio for your artwork today for FREE at Silk.co/artists! Creating a beautiful portfolio with art or photography with Silk is easy. Create a collection of pages for your artwork, and Silk automatically creates a thumbnail grid on your home page. By adding tags about your artwork you can let your visitors explore your work by date, medium, or any other attribute. Visit http://Silk.co/artists to create your beautiful free portfolio today!